The White House Staff Files of Sanford L. Fox is one of the more interesting collections at the John F. Kennedy Presidential Library, and it’s also the most recent addition to our digital collections. Sanford Fox came to work in the White House in 1952, ultimately rising to the position of Chief of the Social Entertainments Office in January of 1961, a post he held until 1975. As Chief, Mr. Fox was responsible for the planning, organization, and execution of events at the White House including state dinners, luncheons, teas, receptions, concerts, and informal dinners. He oversaw general protocol, as well as the engraving, printing, and calligraphy for menus, invitations, and seating arrangements. The collection consists of two series: Guest Index, 1961-1964, containing an index card for each person who attended an event at the White House; and Social Events, 1961-1964, containing a folder for each event comprised of press releases, guest lists, printed menus, invitations, RSVPs, and entertainment programs. Also included in the Social Events series are folders related to President Kennedy’s funeral and three boxes of oversize, hand-printed seating plans. 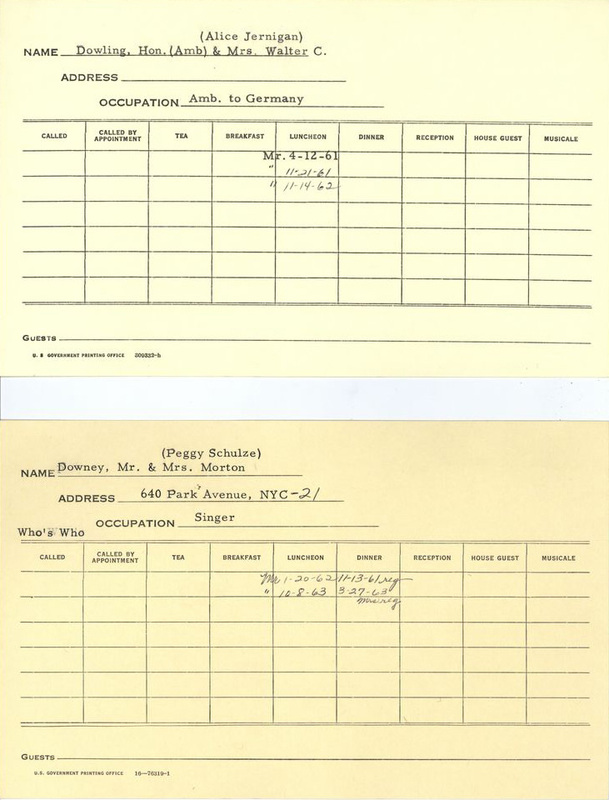 Guest Index card showing individual, occupation, spouse, and events attended with dates. View rest of folder here. 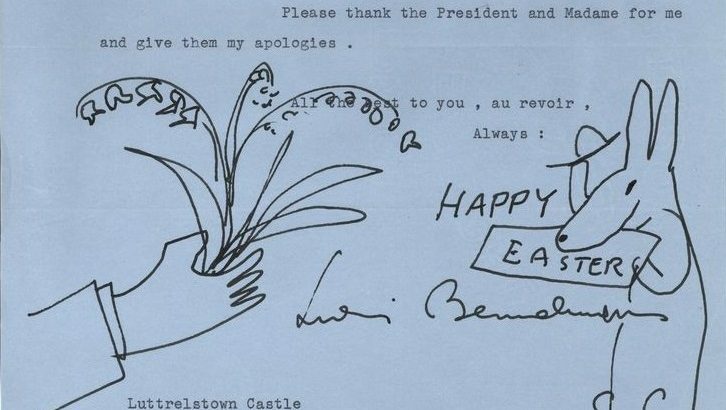 Letter of regret from Ludwig Bemelmans to Letitia Baldridge, Nobel Prize winners dinner. View entire folder here. 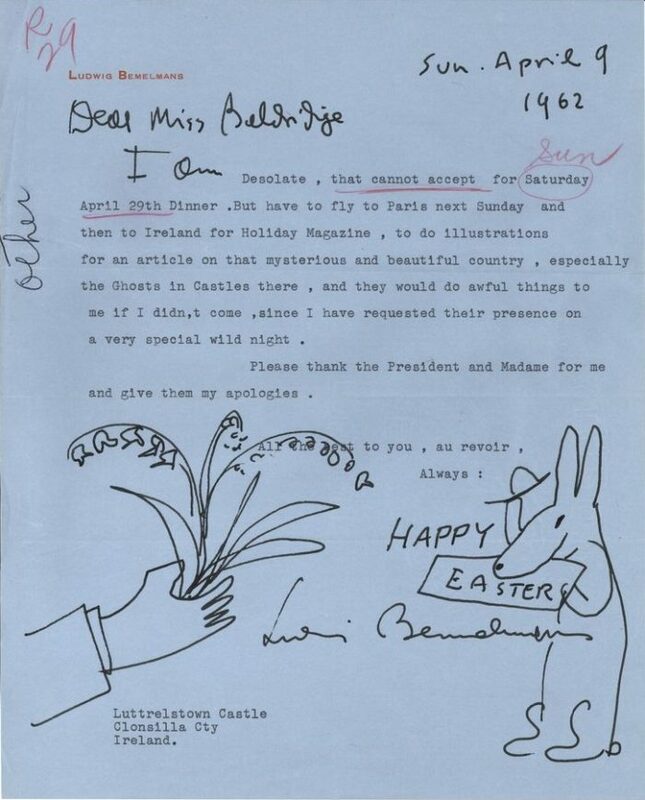 Page one of a guest list for a dinner-dance for friends at the White House on March 8, 1963. View entire folder here. 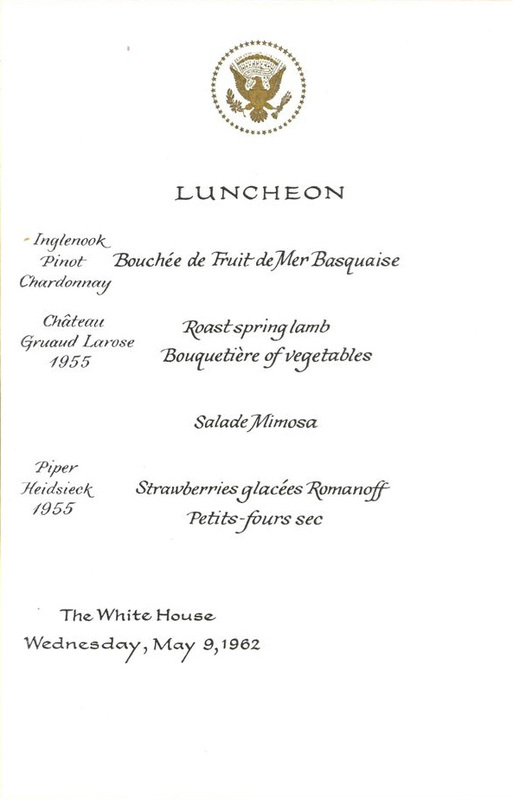 Menu for a luncheon for Prime Minister Gerhardsen of Norway and Mrs. Gerhardsen. View entire folder here. 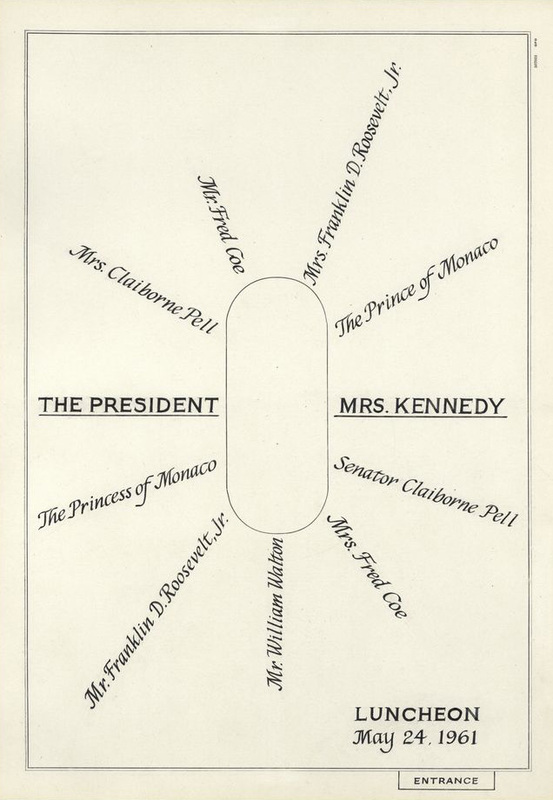 Seating plan for a luncheon at the White House for the Prince and Princess of Monaco on May 24, 1961. View folder here. 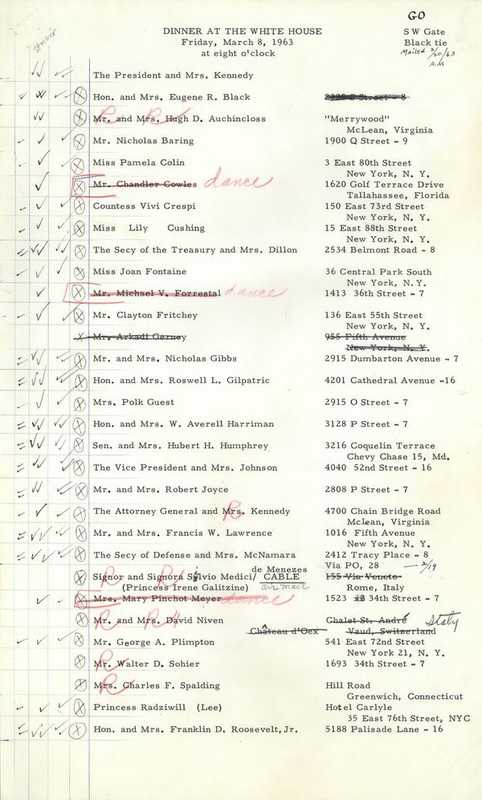 One of the most exciting aspects of the Sanford L. Fox White House Staff Files is that its records are connected to so many other collections at the Library. A folder for any given event may have accompanying photographs from the White House Photographs collection, audio of a toast from the White House Audio Collection, drafts of the toast from the President’s Office Files, or even a film covering a state visit from the United States Government Agencies Collection. For example, the folder maintained by Fox regarding the state dinner at the White House for the King and Queen of Afghanistan in September 1963 is also linked to two folders from the President’s Office Files related to the King and Queen’s visit and toasts given by President Kennedy and King Zahir, an audio recording of President Kennedy’s toast, photographs taken during the event, and a silent motion picture of Air Force Bagpipers and the Marine Band on the South Lawn of the White House [http://www.jfklibrary.org/Asset-Viewer/Archives/JFKWHSFSLF-024-012.aspx].